A few fun seahorse facts. *It is the male seahorse who is impregnated, gestates and gives birth to the babies in their species. *Seahorses, like many species, are vulnerable to extinction. Please don’t buy the dried souvenirs that you see in shell shops or purchase ones for your aquarium. They are best left along in the wild. Today used the same cookie cutter for this one too for the sake of ease. I used Vegan brand mozzarella cheese for the markings and a Wilton food marker to color the blue. She has a cup of shrimp and shell shaped watermelon pieces. 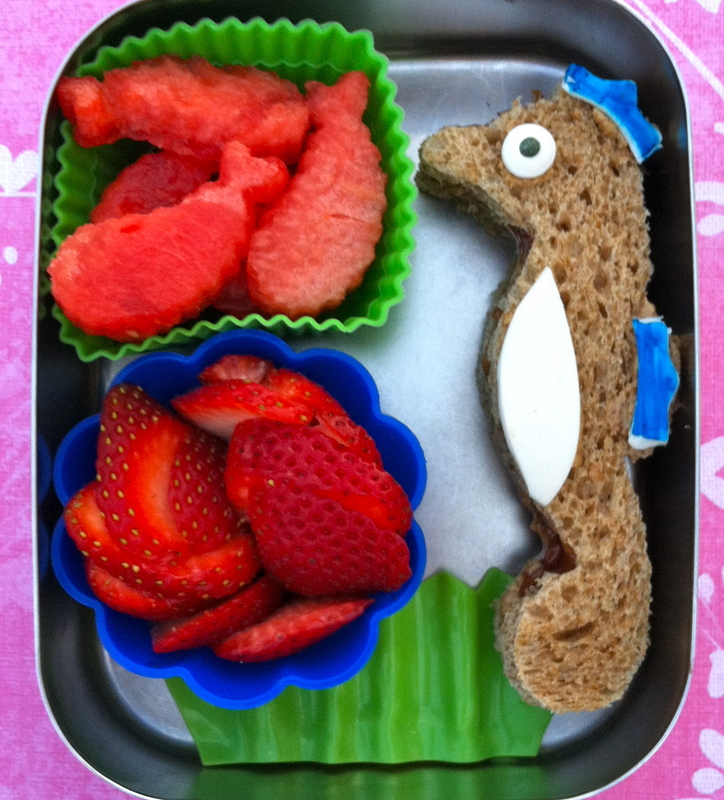 Below that is a cup of thinly sliced strawberries and a piece of baran for sea grass below packed in her LunchBots stainless bento container. Miss G and I were reading a book before bed, and she saw a piece of swiss cheese. She decided she would like that as her sandwich for today along with a little mouse too. The sandwich is made from the same Rudi’s Whole Grain bread. I used my small circle cutters to make the impressions in the bread without pushing it all the way through and then smooshed the middle for the indentations. The strawberry mouse is just hulled. I used Vegan brand cheese to hand cut a tail and I used tiny cutters for the face and ears. Under the sandwich is a pick of blueberries. In the top right compartment are grapes and a piece of watermelon. Below that is a flower cup of So Delicious brand strawberry flavored coconut milk yogurt with a strawberry flower on top. If you like what I do, please support me by voting! I’m in the running for one of the Circle of Mom’s Top 25 Foodie Moms! Just click on the button below once a day and then click on Bentoriffic. I’m hovering around # 27 now. There is no registration needed. Just click once a day! Thank you in advance! 8 Responses to "Swiss Cheese and a seahorse"
okay, love them both BUT the mouse and the cheese is just too stinkin’ cute and clever! great job!! Thanks, KMG! It was all Miss G’s idea, the design that is. I came up with the details but she told me exactly what she wanted! Thanks for voting! Here in the states I use Allthingsforsale.com for most of my bento supplies. I do find many things on etsy.com and Amazon.com that are shipped right from Japan and affordable. My best recommendation is to start with small fondant cutters found in your local baking supply store. They will also carry the silicone baking cups and save you the $ on shipping. They take up little space and store easily. I use mostly Easy Lunch Boxes and LunchBots. 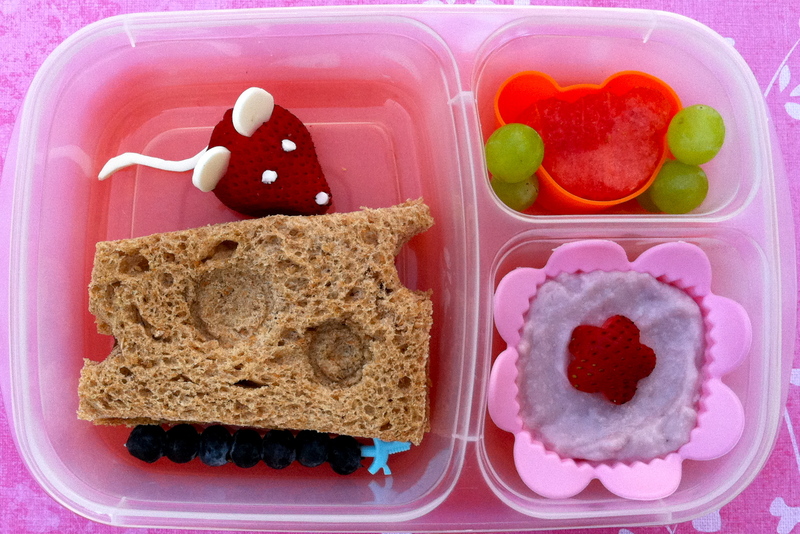 I use rubber bands or bento bands if I’m worried about lids coming off. I store them flat, and it’s rare that they spill but they are NOT leakproof. You may try some of the really cheap, cute Japanese plastic boxes with snapping lids. They are smaller but store well, leak little & are easily replaced. Also, I think http://en.bentoandco.com/ is in France so they may ship cheaply to you too. Best of luck!